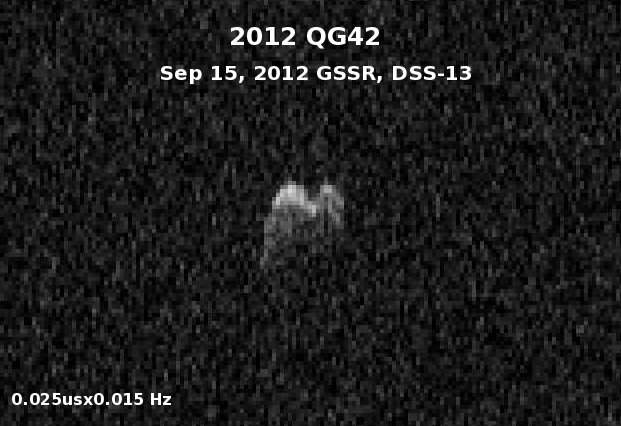 2012 QG42 was discovered by the Catalina Sky Survey on August 26, 2012. Goldstone and Arecibo. 2012 QG42 also makes regular approaches within 0.1 AU of both Venus and Mars. Not much is known about this object, except that its absolute magnitude of 20.69 suggests ~0.23 km diameter (within a factor of two). likely slow (>10 h). The amplitude of their partial lightcurves is ~1 mag, suggesting a very elongated shape. of pixels on the object and reveal considerable surface detail. speckle tracking on Sep 16 and 17. 2012 QG42 brightens below 14th magnitude just prior to its closest approach on Sep 14. It will become a daytime object after Sep 17. Lightcurves, spectroscopy and astrometry are highly desirable prior to the radar observing campaign. 2012 QG42 has been classified as a "Potentially Hazardous Asteroid" by the Minor Planet Center. 160 Castelmartini. Observers E. Prosperi, S. Prosperi. Measurer E. Prosperi. 0.35-m f/10 Schmidt-Cassegrain + CCD. K. Nishiyama. 1.0-m f/3.0 reflector + CCD. F. Nocentini. 0.43-m f/6.8 reflector + CCD. 595 Farra d'Isonzo. Observers E. Pettarin, M. Vivona. Measurer E. Pettarin. 0.40-m f/4.5 reflector + CCD. S. M. Larson, R. H. McNaught. 0.68-m Schmidt + CCD. 900 Moriyama. Observer Y. Ikari. 0.26-m f/7.0 reflector + CCD. C23 Olmen. Observer A. Diepvens. 0.20-m f/9 refractor + CCD. C27 Pallerols. Observer A. Jorba. 0.25-m f/4.8 reflector + CCD. C47 Nonndorf. Observer G. Dangl. 0.25-m f/4.8 reflector + CCD. C77 Bernezzo Observatory. Observer A. Mantero. 0.25-m f/4 reflector + CCD. R. A. Kowalski, S. M. Larson, R. H. McNaught. 0.5-m Uppsala Schmidt + CCD. E23 Arcadia. Observer A. Hidas. 0.35-m Schmidt-Cassegrain + CCD. astrograph + CCD, 0.25-m f/3.4 reflector + CCD. H21 Astronomical Research Observatory, Westfield. Observer R. Holmes. Measurers L. Buzzi, S. Foglia, T. Vorobjov. 0.61-m f/4.0 astrograph + CCD. H36 Sandlot Observatory, Scranton. Observer G. Hug. 0.56-m reflector + CCD. NOTE: TXON is shown at the earliest time, which is only 15 min into the precal time. orbit solution #34 was estimated. was estimated and all predicts updated at GSSR and AO. Last update prior to GSSR track. So pointing changed 3.9", Doppler -69 Hz, delay -7181 usec compared to s19. ranging. After that we hope to do imaging. of up to several hundred Hz. These are from JX, w/ max-band (min-acc) options from Ray Jurgens. Currently configured for 5-sec records.